Blocked Drain In Tunbridge Wells . If you have Blocked Drains and live in Tunbridge Wells – have them unblocked rapidly and professionally by DrainBoss. We are Checkatrade vetted emergency plumbers and clear blocked toilets, sinks, baths, showers and repair leaky pipes etc. DrainBoss also undertake any drain repairs & carry out CCTV drain surveys in the Tunbridge Wells Area. We also offer Gutter Cleaning in Tunbridge Wells using a ladderless Gutter cleaning system. Price Promise – If you think you can find a cheaper price to clear your blocked drains in Tunbridge Wells, Please let us know – We promise to try and beat it! Why Choose DrainBoss To Unblock Drains In Tunbridge Wells? Our plumbers provide Drain Clearance in Tunbridge Wells – We service household and commercial customers, as well as contracts for hotels, letting agents, restaurants, property management companies, clubs and pubs, councils, NHS, Councils, insurance companies and offices. Our plumbing and drain unblocking service covers Tunbridge Wells, Royal Tunbridge Wells, Rusthall, Pembury, Langton Green, Tonbridge, Penshurst, Mayfield, Wadhurst, Stonegate, Ticehurst, Tidebrook, Crowborough, Black Hill, Boars Head, Burnt Oak, Castle Hill, Friars Gate, Mark Cross, Rotherfield and all surrounding areas. We’ll get our approved local Tunbridge Wells plumbers to unblock your drain rapidly. 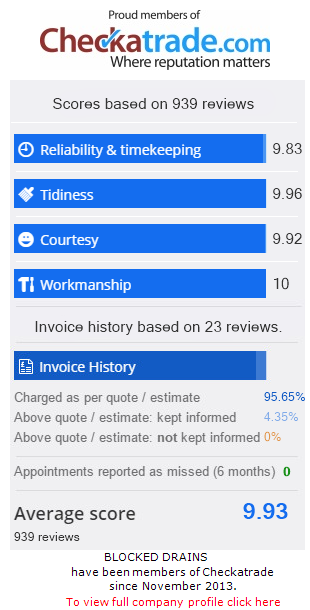 After our plumbers have been, we always ensure a courtesy call is made from our office to ensure you were totally happy with our service as customer satisfaction is key with DrainBoss! DrainBoss can provide residents and businesses across Tunbridge Wells with a free CCTV drain Inspection with each blocked drain we clean to ensure the blockage is completely clear. It will also enable us to see if there is any drain damage. If drain damage is discovered we can advise on the best solution to fix the problem and make any necessary drain repairs. DrainBoss is your local expert in Drain Unblocking in Tunbridge Wells but we also conduct a full drain survey report of how the blocked drain was caused. We have huge experience with blocked drains and can advise if your drain problem is likely to be covered by your accidental insurance cover. We can also deal directly with your insurance company to make things run as smoothly as possible and get your drains back to full working order as soon as possible. Customer satisfaction is paramount with DrainBoss and we welcome all feedback from our customers. Whenever we unblock a drain in Tunbridge Wells we always ask our customers how we performed. You can see our feedback on our checkatrade page. One of our recent customers said “Chris arrived at my house and I was in a right state. I was quoted a set price for clearing my blocked drain over the phone before he arrived. The job turned out to be bigger than expected, however, Chris got on with unblocking the drain. He diagnosed the issue and advised on what action we needed to take to prevent further blockages. Despite the job taking longer than anticipated, Chris stuck to the agreed price. I’d recommend DrainBoss for any drain cleaning or drain repair work and would not hesitate passing their number onto anyone who needed drain cleaning in Tunbridge Wells.” – Vicky Robinson, Tunbridge Wells. – Amy Tanner, Tunbridge Wells. DrainBoss offer a 24-hour emergency call out service to all areas of Tunbridge Wells. We will repair frozen pipes, burst pipes, broken toilets, ball valves, toilet cisterns, leaky taps and many other plumbing problems such as blocked drains and drain repair. We aim to get to a job rapidly and will act promptly to put the emergency right. Are you looking for Gutter Cleaning in Tunbridge Wells? DrainBoss technicians are specialist gutter cleaners in Tunbridge Wells and the surrounding areas including Crowborough and Wadhurst. We have the latest ladder-less gutter vacuum systems which are a much safer way to clean your gutters and they can clean your gutters more effectively and efficiently, giving our customers excellent service and value for money. So if you need your gutters cleaned in Tunbridge Wells, Crowborough and Wadhurst, call us now on 01892 882295 or 07772 535248. Nothing can ruin a homeowner’s day faster than a blocked drain. Most people don’t spend much time thinking about the layers of pipes that run through their home, but the system is important, and one that we greatly rely on. The simplest and most common method for cleaning your drain using a snake, or cable. This tool is extended down the drain until it reaches the clog, then snagging it or pushing it through to the main city sewer system. Cables come in different sizes and lengths for different drains and pipes. One downside to this method is that it can sometimes only partially clear a clog, leaving it to create future problems. If a clog requires more extensive cleaning, a high-pressure water jet can be used to clean the pipes. This method is more high impact and tends to be more thorough than a simple snake. The high-pressure water is great at clearing things like sludge, standing water, rocks, and sand, and easily flush debris away. In addition to the drains in your home, sometimes storm drains can have trouble with blockages. Storm sewers are designed to drain rain and excess groundwater from areas such as streets, parking lots, and sidewalks. In addition to natural debris like sticks and leaves, litter like cans, bottles, bags and more can find their way into the storm system causing clogs and blockages. If the storm drains are blocked, it can cause backups that result in flooding, causing transportation and safety issues. Regular maintenance is imperative in maintaining the quality of water being released into the environment as well as avoiding extensive repair costs. When these systems become blocked, they can cause property damage and a build-up of harmful gasses and odours. Beyond residential drains and pipes, water jetting can be an effective way to clean storm drains. The high pressure clears away build-ups to allow stormwater to drain properly. We can use our CCTV camera system to track down the underlying problem with your plumbing and drainage system and devise a way to repair it. Drain repair is something every property owner has to deal with from time to time. It’s best to be prepared when the time comes. Call us at01892 882295 or 07772 535248 to address any blocked drain or drain repair issues in Tunbridge Wells. Call DrainBoss now for clearance of all blocked drains in Tunbridge Wells.